Busy Phillips was recently spotted leaving Irene Neuwirth in West Hollywood with a pale pink mini backpack from Mansur Gavriel. The brand just did a shop re-stock in mid-May, did any of you benefit? The Mansur Gavriel website says the next restock will be in August. We'll keep you posted, of course. Here's Chrissy Teigen sporting a classically Chrissy Teigen look at LAX: floppy hat, distressed denim, Givenchy Antigona bag, designer shades, and what I interpret to be a silk hooded trench of some sort. As we've documented in the past, Chrissy is a big fan of this bag. 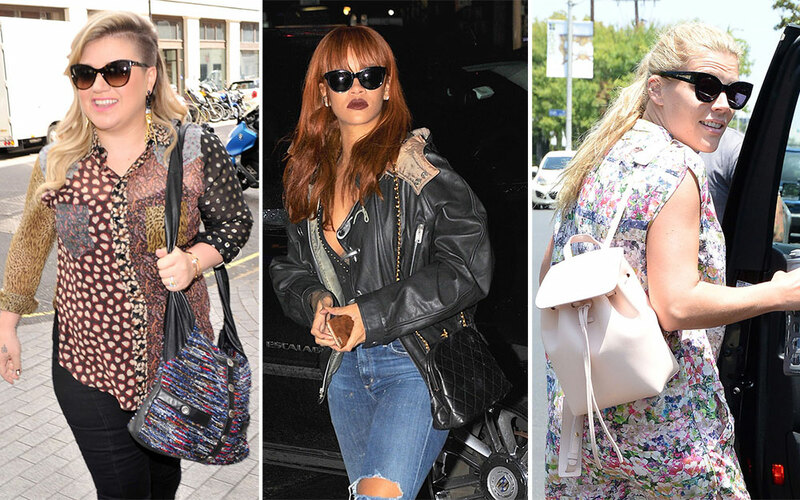 The Chanel Girl Bag has precious few fans among PurseBlog readers, based on your comments, but Kelly Clarkson is a Chanel Girl ally! Here she is leaving BBC Radio 1 in London with a multi-colored bouclé tweed version of the bag. Kesha was recently spotted at LAX carrying an attractive black Fendi 2Jours Tote and wearing purple lipstick with her neon green hair. Kesha had been toning it down a bit with her look in recent months, but I think this is the Kesha we all know and love. We don't currently have a "The Many Bags of Kesha" post on PB. I'm just gonna let the universe do what it will with that info. Here's Lily Collins, leaving her office in LA with a bright red mini Diane von Furstenburg Sutra. Why does Lily Collins have an office? Is that now a requirement for up-and-coming celebs? I thought only the Reese Witherspoons and Beyoncés of the world needed offices. Princess Beatrice was recently seen Leaving The Ivy in London with a stylish and surprisingly (comparatively) affordable satchel from Auxiliary, a bag line that's exclusively available from the Canadian retailer Aritzia. Rihanna has been carrying more vintage bags than you'd expect in the past couple months, and here she is on her way in to the NYC club Griffin with a little vintage Chanel. We believe this sharp little bag is a new offering from Victoria's line, but we couldn't confirm. Victoria, you have our attention. Ladies, if you have information that indicates otherwise, please share in the comments.